Mr Hollywood was in demand! I hadn’t pre-booked tickets for the Cake and Bake Show in Manchester though I’d read through the advertisements and began following them on Twitter. With one thing and another I’ve not been pre-planning anything! So when, on Thursday, the Flour Bin tweeted a competition to give away two tickets, and I was feeling well, the sun had been shining all day and was predicted to stay shining, and Mr W was going to be free from commitments, I was thrilled to win them and arranged to pick them up at the booking desk on Friday. I had an appointment first thing but we were in Manchester for 12 and after a quick coffee we set off down to Manchester Central. There is a free bus from Piccadilly Station but it’s only a 10 minute walk to get there. We collected our tickets, took off two layers of our clothing and entered the venue. I have to say my stomach sank a little as we walked round the first stands. They were all cup cake, cake pop, icing embellishments, so icing, icing and more icing. We headed down the left hand side of the building and it was more of the same. The Cake Walk display was stunning and it will be interesting to see who won. I think Eric Lanlard was judging that at the end of day one. We were glad to arrive at the first flour stall – Marriage’s Flour – and see their display and I was tempted by offers on the flour stalls but as we planned to go for a meal later in the city and then walk back to the station it was not ideal to have kilos of flour to carry. Doves Farm and Allinsons had show offers too. At the far end of the hall were two display kitchens with plenty of space to view. Eric Lanlard was in the first one but I spotted Patrick Moore in The Bakery – Patrick is the baker behind More? 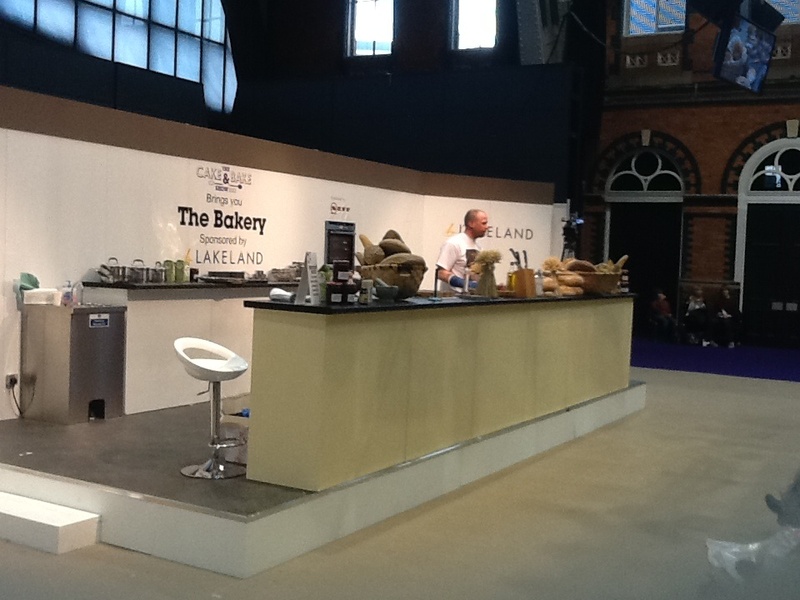 – The Artisan Bakery based in the South Lakes village of Staveley and we got seats to watch his Sourdough display. 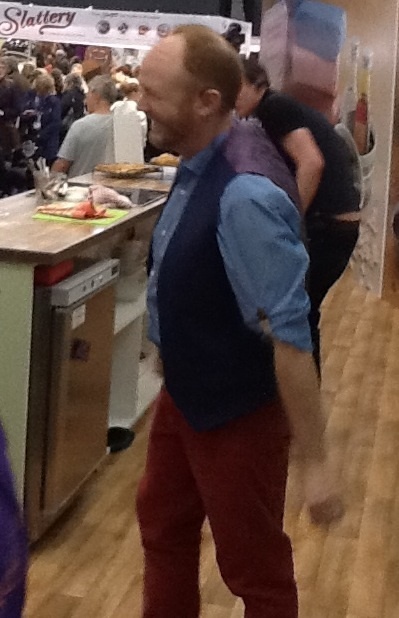 I really enjoyed it – but I am now a real bread junkie so could have listened and watched him all day! I think I’d have been disappointed if I’d paid extra for pre booking any of the main kitchen displays as there were just four rows roped off at the front and we had no trouble getting a seat for any of the bread talks but perhaps on a Saturday or Sunday it would have been different. Luckily straight on the stand after Patrick was Aiden Chapman from The Phoenix Bakery in Weymouth – again talking sourdough. He had dough in bannetons that had been in his car for two days and baked them during his demonstration. He was trying to show how forgiving dough can be and encourage everyone to try home bread baking. He is a Real Bread campaign champion. He enjoyed ripping apart and moulding some slices of supermarket white sliced bread and listing the ingredients for the uninitiated! 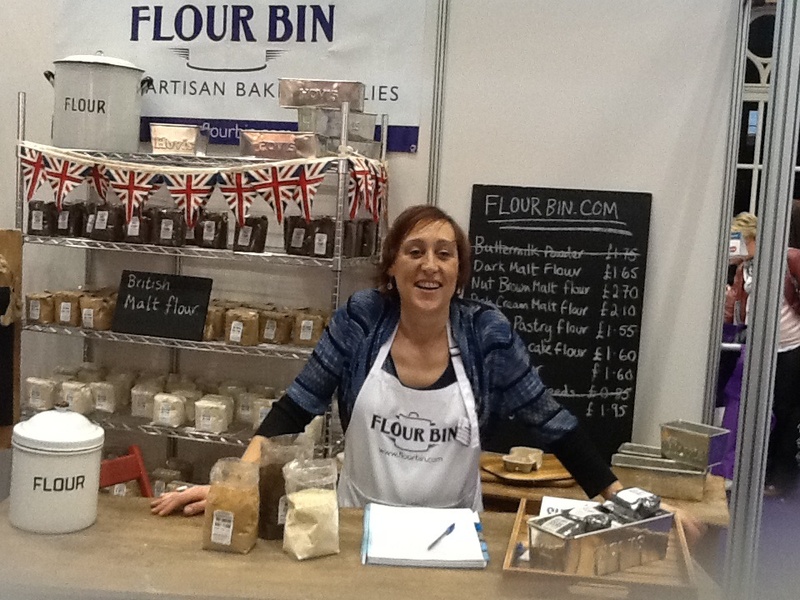 We had another walk round then and met the lovely girls on the Flour Bin stand and had a good chat with them. They were thrilled that their products were proving so popular and had sent for extra stock! 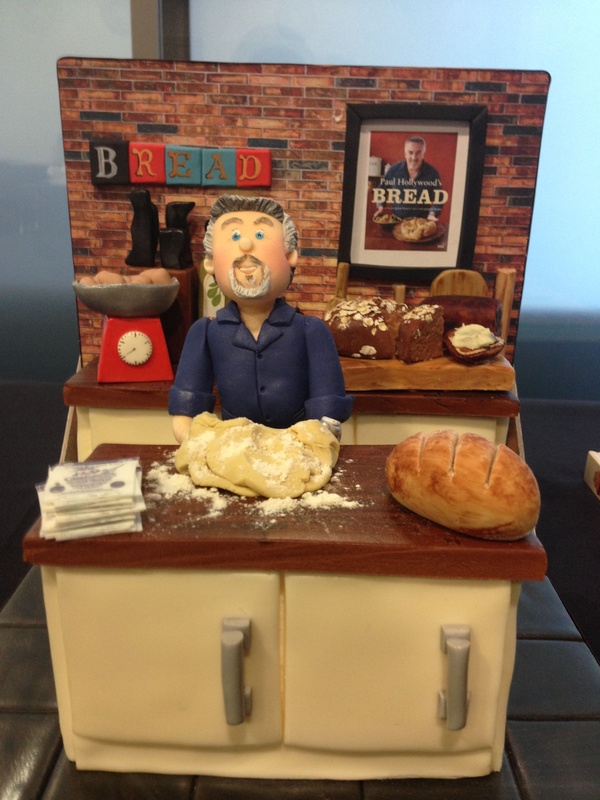 They are able to source products to meet current trends and react quickly when someone like Paul Hollywood uses an unusual flour that customers begin searching for. Talking of the Hollywood Baker he was all over during the show, appearing in The Bakery and also spending a lot of time in the Grain Kitchen doing competitions with children, signing autographs etc and even appearing on a fantastic cake. It was nicely organised that there were a number of events suitable for children – gingerbread men decorating one popular activity! Now I know we don’t do supermarkets but I hope sitting in the Sainsburys exhibition kitchen doesn’t break my duck! Our timing was perfect (though admittedly uplanned) as not only did we stroll straight into the show when many others tweeted about 1,000 queuing to get in, but we also saw demonstrations by a lot of my bready favourites. As we approached the Sainburys kitchen GBBO contestants from the last series were just finishing and the charming Dan Lepard was preparing so we got good seats and really appreciated his no knead, no fuss demo of a Focaccia recipe. (Though I would have to totally ignore the Sainburys flour advertising on display!). I really find that the real bread making community is so friendly, unpretentious and down to earth. Always ready to share hints and tips, recipes and the love of a good crumb! So we had a great afternoon topped off by receiving huge bars of Green & Blacks chocolate as we made our way out dinner!